A group of seven Nek Chand Foundation volunteers have completed beautiful mosaic art on a series of previously bare concrete columns in Phase 3 of the Rock Garden, Chandigarh. From mid-February to mid-March, the hard-working volunteers from Australia, UK and USA covered a total of eight large columns with a variety of unique, eye-catching and well-planned designs using broken tiles following Nek Chand's typical mosaic methods. An interesting and valuable report on the November to December 2013 Rock Garden volunteer group's work and on the current state of the Rock Garden has been written by leading US-based NCF supporter, Christine Style. The piece - accompanied by great photos - is in the Volunteer section of the website. A short report by Cathy Amos on mosaic work at the Rock Garden by Nek Chand Foundation volunteers in November 2013 has been added under the Volunteer menu heading. Two photographs show the beautiful finished pillars and the report explains the work process - something that may be of great help to future mosaicist volunteers. The Indian Express has reported on the neglected Rock Garden at Punjab Agricultural University in Ludhiana in a story echoing the Nek Chand Foundation website article of 2 March 2012. 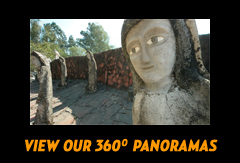 The University's small Rock Garden was created over twenty years ago under the direction of Nek Chand and with a gift from him of around 30 statues to his friend and former University Chancellor, Dr M S Randhawa. The Rock Garden has been selected to feature in India's 65th Republic Day parade in New Delhi on 26th January 2014, The Times of India reports.